I had some trouble getting it to build, but now I have it running. 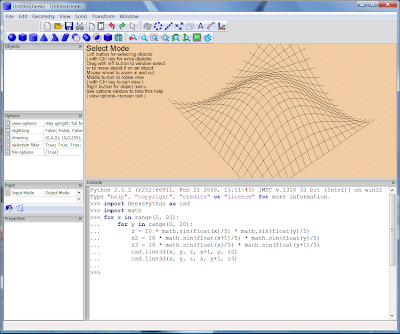 It adds a Python console window to HeeksCAD, which will allow us to do things more interesting than we can imagine. The first thing I did was make some lines in a pretty pattern. This is only for Windows at the moment and isn't available in the current HeeksCAD 0.7.0 installation. My youngest daughter asked me to engrave her name on my phone, because her sister's name is already on there. I took the oportunity to use the pocketing operation. It was quite easy to use and I'm pleased with the result. I made her name in Inkscape and opened it in HeeksCNC as a SVG file. I got the heart shape as a SVG file from Wikipedia ( the page about love ) and imported it into HeeksCNC. I drew the rectangle after measuring how much space there was on my phone. I clamped a lump of wood in my machine's vice and machined it flat with a big tool, just using jog moves. I superglued the flexible battery cover from my phone onto the wood to make sure it was flat.